Students on placement for their MA in Occupational Therapy, under the supervision of Hilary Lee at John Bryant House WA, share the instant delight and positive effects taking place through the facility’s inter-generational program. This program has proved a tremendous success with the hostel residents actively looking forward to the weekly visits from the children. Many happy memories are brought to life as residents reminisce about their own families and significant life events. 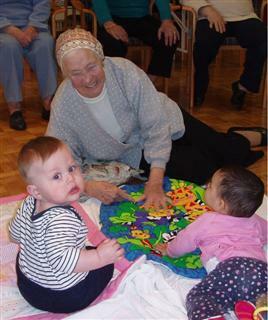 The happiness the playgroup sessions invoke can be seen on the residents’ beaming faces as they play with the children. The playgroup offers them an outlet to express their love for others. When the residents are with the children, they appear more responsive and happier. One resident was asked if she would like to attend one of the activity sessions. At first she did not respond; however after mentioning that the activity involved small children, her face lit up and she immediately began walking without the frame she regularly used. She stepped briskly down the long corridor continually expressing her excitement and delight in anticipation of visiting the children. No sooner had she arrived at the playgroup than she squatted down and then lay on the floor in order to interact with the infants. There was no denying her joy and sudden restoration in sense of purpose as she played with the young children, smiling and enjoying the moment with them. Involvement in the inter-generational program at John Bryant House has provided us with better understanding and the realisation that often the best therapy is to provide opportunities for happiness and increased meaning in the lives of residents. Programs such as playgroup restore a sense of purpose by allowing them to engage in “activities” that they intrinsically enjoy and often have an intuition for. For many of the residents at John Bryant House, enjoyment in life comes from living for the moment, especially on playgroup days.